Regarding the article: "Maimonides  the Saint and the Heretic"
On our new Internet Web Page we have an animated display (cleverly done by our expert Webmaster) that swirls through the air from afar into a final billboard scene that announces that people are now tuned online to the A.S.K. Web Site. This moving display is the last item to appear on the Web Page. It is first preceded by several important statements that people always ask about the site of the Temples in Jerusalem. All of you should click into the askelm.com Web Page on the Internet and see the display in its entirety. Youll like it. Also, anyone doing research into matters dealing with the location of the Temples of God in Jerusalem must first be aware of some pitfalls that everyone encounters. Some of them deal with fundamental errors (even lies and deliberate falsehoods) that pepper the historical records particularly from the fourth to the thirteen centuries (and there is a good deal of fabrication in sixteenth century literature). These lies are in the main now fully recognized by modern scholars (thankfully), but they still remain in the various texts and must be answered by all of us trying to discover the truths concerning the whereabouts of the Temples. One of the prime lies (and most scholars as I have said recognize it as such) is found in the writings of Josephus that the priest/historian himself would NEVER have placed into his text (unless, perchance, he would have had five glasses of wine at the Purim festival  I am kidding I hope you know). This reference in the account of Josephus is clearly (and without the slightest doubt) a later insertion by malicious persons in probably the fourth century as a means of vindicating the Church of the Holy Sepulchre on the western hill as the "Temple" of God and that it was NOT located either at the Dome of the Rock or at the Gihon Spring (where it actually was). It is found in Josephus, War V.4,1. It states in clear Greek (and it blends cleverly into the context in a way that would fool even the most astute scholar if he or she did not know better) that Mount Zion was on the southwest hill (the Upper City of Josephus). It states that hill to be the Zion of David. This verse has caused so much mischief over the centuries. It actually caused some of the top historians and biblical scholars until the year A.D.1875 to believe that the SOUTHWEST hill (that is, the Upper City of Josephus) was indeed the real "Mount Zion" of the Bible. No scholar today believes that this indication in the text of Josephus is correct, but they (and all of us) are at a loss to explain how the nonsense got put into the text (inserted spuriously into the text). Thankfully, all scholars today have seen the absurdity of this obvious erroneous insertion and they now accept (correctly) that the original "Mount Zion" of David was located on the SOUTHEAST ridge and on the very southern end of the ridge (see any modern Atlas for this fact). If you will read my book carefully, I show how Simon the Hasmonean in the middle of the second century before Christ torn down the old Mount Zion and placed everything onto the Southwest hill and renaming it the New Mount Zion. But in no circumstances was this southwest hill the place where David captured the city of Zion from the Canaanites (then called Jebus). That "Zion" was still on the southeast hill. Of course, no one would think a decent and upright Christian would insert something into the text of Josephus that the Jewish priest/historian would never of himself stated. Oh? The fact is, brethren, that erroneous and mischievous statement got into the text of Josephus when our dear Christians copyists had control of the texts. This shows that they thought nothing of lying when it suited their purpose. As a matter of fact, look at the fallacious quote even in the New Testament itself found in I John 5:7 and 8. That part about the Trinity is a pure insertion by so-called pious Christians who wanted even the Scriptures to support the ridiculous Trinity doctrine that the Chalcedon bunch of ignoramuses promoted. These heretics were bold enough to try to enter the doctrine into the very text of the Holy Scriptures. Their plan did not work in the long run. Though you find the spurious and inserted text in our King James Version, it is accepted by all modern scholars that the part about the so-called Trinity of the Nicean and Chalcedon conclusions is pure fabrication and in no way should it be in the text of the New Testament. Neither should the bit about Mount Zion being on the southwest hill in Jerusalem be accepted (and it is NOT) by anyone with common sense. Another warning to researchers into the location of the Temples. All writers, historians and theologians with the time of the Crusades until now (that is, until Ernest L. Martin basically straightened out the mess) accept that all references to a prominent "Rock" in Jerusalem in Christian, Jewish and Arabic literature from the fifth to the sixteenth centuries are often interpreted by scholars to mean the "Rock" underneath the Dome of the Rock. Believe me, you ought to see (it is actually funny and amusing in one way) how the scholars twist, cajole, pummel, mash, push and fudge the texts to make the records about a "Rock" fit the Dome of the Rock. After reading the scholars interpretations (and even their false translations of the original documents), they bend and stretch the eyewitness accounts (which normally have the "Rock" in the right place near the Gihon Spring) into making them state it was under the Dome of the Rock. I have some examples of this false and malicious achievement in my book. But be warned! If you look at most records as provided by the scholars since the sixth century C.E., you will be forced by them in their translations and interpretations to make the same wrong interpretation. For example, Aristeas said there was an "inexhaustible spring of water" within the Temple precincts. But how does a professor in Charlesworths work on the Apocrypha and Pseudepigraphical works translate the sentence? He states that it was "just as if" there were a spring there. He did this because he honestly believed the Temple was located at the Dome of the Rock and this belief misled him in translation (he was trying to be fair in interpretation and it is hard to blame him because all of us, including me, believed before 1995 that the Dome was the Temple site). The truth is, however, there is not (nor has been) an inexhaustible spring under the Dome of the Rock. So, when you do research into this subject of the Temple, you must be aware that ALL scholars today (BAR NONE  except those who have recently read my new research and correctly accept it) will stretch, cajole, twist and fudge the records about a "rock" to make every historical account of the ancients fit the WRONG site of the Dome of the Rock for the Temple location of Herod and Jesus. This false act makes the history of Jerusalem fall into utter confusion. On the other hand, if you (or any of the scholars) will first recognize that ALL the Temples were indeed located over and near the Gihon Spring, and that the Jewish authorities knew this fact until the generation just before the Crusades, then virtually EVERY STATEMENT in the records (even the records of the seventh to tenth century Christians and Muslims, which Dr. Dan Bahat in his Illustrated Atlas of Jerusalem states are quite contradictory) will begin to make sense. My new book on the subject is devoted to straighten out the matter. So, when you or any scholar does research into the later records of the Christians and Muslims, be prepared to witness many contradictions in the records because they are in most circumstances erroneously entering the texts by identifying various and sundry "rocks" in Jerusalem with the "Rock" under the Dome of the Rock. It is false interpretations by the ancients (and moderns) that have caused the problem. The fact is, I have considerable more evidence to give that shows the true site of the Temples of God. There can be no doubt that the original Temples (from Solomon to Herod) were built over and near the Gihon Spring on the southeast ridge of Jerusalem (the original area of the Mount Zion of David and the Holy Scriptures). The outstanding feature of this new research is the realization that when Christ Jesus said that every stone of the Herodian Temple (and this includes its outer walls) would be torn down to the ground and that not one stone would in the future be on top of another, that Christs prophecy came true in a very precise manner. 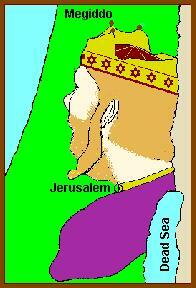 What was left in Jerusalem from early Herodian times was Fort Antonia. The Haram esh-Sharif is the remains of that Fort Antonia. That fortress continued to house the Tenth Roman Legion until A.D.289 when the Legion was then dispatched to Ailat on the Red Sea. When our Jewish, Muslim and Christian friends realize the truth of these matters, it may help to "level the ground" for all parties in Jerusalem when they come to negotiate the terms of who should politically and religiously rule in the various sections of Jerusalem. I hope that this information will prove valuable in bringing in a condition of peace in the area of Jerusalem that all people on earth will find acceptable. History is the key that will help us in our present plight. I hope we use it, and use it correctly, in order to bring about a civil and common sense result. As for us who love the truths of the Holy Scriptures, we should be thankful to God that He has taken blinders off our eyes and the stoppers from our ears. He has now let us return to the simple teachings of the Scriptures on these matters. The truth shows that Christ Jesus was right after all. What one has to do now is to thoroughly jettison from ones mind that the Dome of the Rock is the Temple site. When one does, then the records of history begin to make sense as never before. See my new book for the truth of this matter.